How do you talk with people about a subject matter that is emphatically avoided in polite conversations? 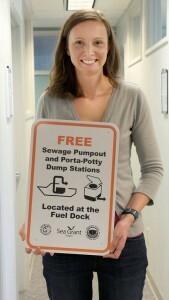 That is the question Oregon Sea Grant Extension’s new boating outreach coordinator, Jenny East, has been asking. She’s charged with informing recreational boaters about the location of facilities for properly disposing of their sewage along the Oregon coast and Columbia River and in the Portland-metro area in an effort to keep waterways clean. The breadth of Extension work is, well, breathtaking. This new position takes Extension work in a new direction. “My job is all about finding innovative ways to engage with Oregon’s recreational boaters. The key will be trying different avenues such as face-to-face interactions at events where boaters are, walking the docks, and spending time meeting with marina managers and private industries that provide supplies for boaters,” said East, who is based out of Oregon State University’s Extension office in Washington County. As part of her job, she will work with the Oregon State Marine Board to post signs showing where recreational boaters can empty their portable toilets and holding tanks. East added that talking about the proper disposal of human waste will take some humor. She’s got a good start. 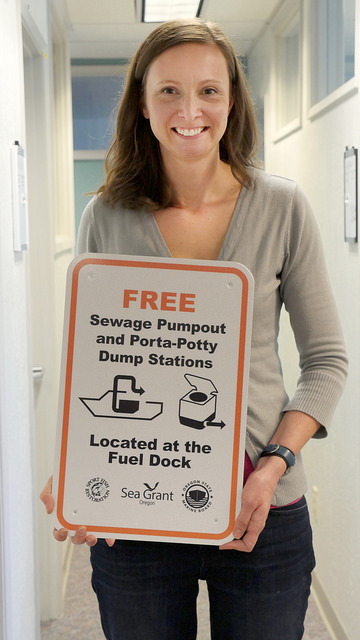 Oregon Sea Grant has produced two light-hearted public service announcements about floating restrooms and dockside stations for emptying porta-potties. Oregon Sea Grant serves the state, region and nation through an integrated program of research, outreach, and education that helps people understand, rationally use and conserve marine and coastal resources. The best available science is applied to timely and important ocean and coastal issues, and they engage with coastal stakeholders to help them reach informed decisions. Sea Grant supports scientific excellence and innovation, fosters new generations of marine scientists and encourages ocean science literacy among people of all ages. Based at Oregon State University and working with scientists, scholars and communities statewide, Oregon is part of the national network of NOAA Sea Grant College Programs. Oregon State is the state’s Land Grant university and is the only university in the U.S. to have Sea Grant, Space Grant and Sun Grant designations.